Millions of students of ALL AGES, many with 20/20 eyesight, have “educational near vision” problems that interfere with their school success. EYES ON TRACK is a breakthrough book for parents and teachers to identify and help students that struggle with reading. Dr. Kristy Remick shares her 30 years of experience with readers to help students overcome reading difficulties that enable students to reach their full potential. •	EYES ON TRACKTM features a new Detection Screening, a system that is easy to use in the classroom. •	Detection Screening identifies left eye dominant students (LEDs), EYE TRACKING issues, and VISION PROCESSING problems. •	Left eye dominant students (LEDs) often struggle to read. Teachers and parents have not been aware of the role that eye dominance plays in developing reading skills. 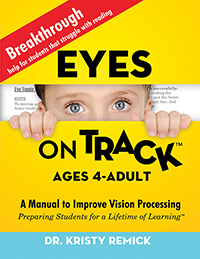 EYES ON TRACKTM offers 16 innovative VISION PRACTICES that help students of all ages to develop the EYE TRACKING skills and VISION PROCESSING skills necessary to create a solid foundation for successful learning.